Hanan Slarsky got the bar mitzvah gift he really wanted – a ticket for the Stephen Marley and Matisyahu show. He wasn’t thrilled that his date was his mother, Rabbi Tracy Nathan, but that didn’t detract from his enjoyment, or the overflow crowd at The Atomic Cowboy Pavilion on Sunday, June 3. The 13-year-old Slarsky celebrated his new status as a man by hearing Jewish hip-hop king Matisyahu. Also in the audience was a multi-tattooed, Stephen Marley super-fan named Reymand (yes, there was a Reymand tatt on his forearm) bearing a vintage Stephen Marley LP and Sharpie - hoping to get an autograph. The LP did double-duty, serving as an oversize coaster for several cans of Budweiser. Marley and Matisyahu’s “Strength to Strength” tour kicked off in late May and will make stops at venues big (Ravinia Festival in Chicago) and small (the Chicken Shack in Nantucket). The St. Louis show took advantage of cool temps and the outdoor stage at Atomic Cowboy. The vibe in the audience was mellow, but the stage presence of the dual headliners kept the energy up throughout the evening. Marley and Matisyahu were born about 20 miles apart (Wilmington, Del. and West Chester, Pa). That may be one of the few things they have in common. Well, that and a love of reggae music. Marley has Jamaican roots, while Matisyahu was raised in a religious Jewish household. The musical styles of Marley and Matisyahu are distinctly different, but they both make good use of their bass guitarist to lay down a steady rhythm. Marley backed his brother, Ziggy as a member of the Melody Makers, before going solo. He also has a long list of credits as a top producer. His voice and delivery are eerily similar to his father,Bob's and his song selection on the "Strength to Strength" tour offers his own take on his father’s classics. Matisyahu, which means “Gift of God” in Hebrew, was born Matthew Paul Miller. He combines reggae, rock and hip hop beatboxing. During his Atomic Cowboy set, Matisyahu prowled the stage like a caged tiger, twirling, spinning and thrusting the mic. His interest in reggae came after Matisyahu’s aunt married a man from Barbados. He visited them in the Caribbean and was intrigued by the music he heard. That led him to being a fan of Bob Marley. Matisyahu combined his knowledge of Hebrew and Judaism music to develop his own unique style. It came complete with the look of a Torah-observant Jewish man: Matisyahu performed earlier in his career dressed in a prayer shawl (tallit) and skullcap (yarmulke). In 2011, he stripped down, so to speak and abandoned the Chasidic persona. Then, as now, Matisyahu arrives on stage with nothing but a mic. He lets his rhyming and music do all the talking. 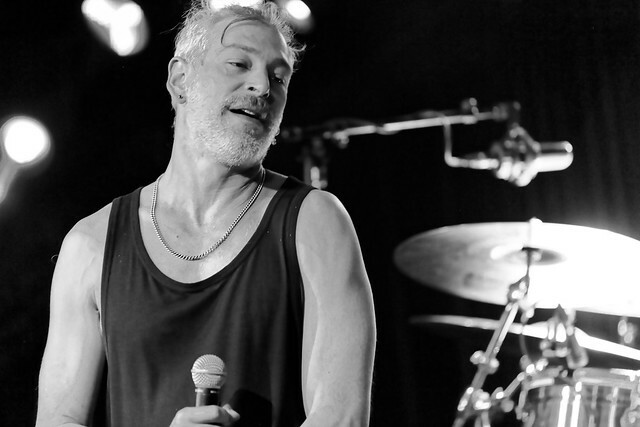 Matisyahu performs at The Atomic Cowboy, June 3, 2018. Photos by Bill Motchan. Head over to Flickr to see his full set of photos from the show.